A multi-volume, unapologetically chauvinistic personal history of the more than 320 American drivers and the American cars that have participated in what National Geographic in their 10 Best of Everything book has called “the world’s greatest sporting event,” the oldest, longest, most challenging and most famous road race of all, the epic 24 Hours of Le Mans. Beautifully illustrated and spanning from the first “Grand Prix d’Endurance de 24 Heures,” in 1923, to present day, Twice Around the Clock: The Yanks at Le Mans is told primarily from the point of view of America’s motorsports heroes, as much as possible in their own voices, from interviews conducted over years. These personal stories are framed by a narrative to set the stage, year by year. Obviously, it would be impossible to tell every participant’s story in detail, but each and all are included and the depth of attention given, determined as much by entertainment value as historical importance. There are many books about Le Mans, good books, but they rightly concentrate on the races and results.Twice Around the Clock: The Yanks at Le Mans complements these accounts and adds to the body of history with untold personal stories of American drivers, team owners, mechanics and witnesses – like the American soldiers stationed in Europe who often ended up helping the teams. These volumes are about their experiences at Le Mans, on and off the track. And, oh, the stories! Frank, sometimes blunt, personal accounts make history human – and these volumes unique. Each is close to 120,000 words in length with approximately 300 black and white and color images from around the world, interspersed throughout – many never seen before. While the narrative stresses the personal, there are many new details for aficionados, and for historians and academics, comprehensive appendices with complete statistical records for every American driver, car and engine ever to compete at the Sarthe, as well as citations for every quote and photo credits. • Research and interviews conducted for 26 years, written over the last six years. • Photographs, many never before seen, from the great photographers over the ages, and personal pictures from the participants. Even those published before have never been seen as presented in Yanks, often with captions by the participants. • Personal stories from hundreds of American drivers, owners, crewmembers, from the first American to drive at Le Mans in 1929, to the most recent competitors – some famous, some not – all heroes for competing in the world’s most important endurance race. It’s the personal stories that are the heart of Yanks and make it unique. They add humanity – and a fair bit of profanity – to history. Some quite surprising – the night before the 1966 race, the driver of America’s first overall winning car stood guard as a confederate broke into the Ford garage to make unauthorized adjustments. Some downright controversial – an American team member claims he relieved a famous Yank driver for several pre-dawn laps on the race winner that year, grounds for disqualification if discovered. Some poignant – one of America’s best pulled into the pits in tears after believing he’d just hit the dead body of his friend who’d crashed and been thrown back onto the track. And many just plain funny – a U.S. champion, unbeknown to anyone, blind in one eye, tells of his panic when the female medical examiner at Le Mans clapped a paddle over his good eye before he could read the chart. What to do? American ingenuity – he reached out and grasped the back of her leg. “Monsieur!” The paddle dropped just long enough for a glimpse. • Complete results tables after each chapter, with American drivers, cars, engines and teams in bold to stand apart. The son of movie producer John Considine and Carmen Pantages, daughter of theater magnate Alexander Pantages, Tim Considine is still remembered by two generations for his title acting roles in Spin & Marty and The Hardy Boys series within Walt Disney's original Mickey Mouse Club, Disney's Shaggy Dog movie, and in the award- winning television series, My Three Sons, and his performance as the soldier slapped in the movie Patton. But for several decades, he's been best known for his writing, photography and for the historical symposiums and seminars he hosts. Mr. Considine began to direct while on My Three Sons, and then with his brother John, launched a screenwriting career with teleplays for that show, Combat, and Tarzan. Their first feature was a Tarzan movie, The Deadly Silence. Mr. Considine has also produced, directed, and twice photographed documentary films for public television and is credited as the consultant for Audi's award-winning 2011 documentary about Le Mans, Truth in 24. In 1975 and 1976, he accompanied and photographed the world-renowned soccer player, Pelé, on his first U.S., Canadian, and European tour with the New York Cosmos. Considine photographs are now on display in museums (among them, the Fangio Museum in Balcarce, Argentina) and have appeared worldwide in newspapers, magazines (Time, Sports Illustrated, Sport, Road & Track, Goal, AutoWeek, European Car, Vintage Racecar Journal, etc. in the U.S.), print ads (Stanley Tools, Spaulding Sporting Goods, Pony Shoes, etc.) and on book covers The Complete Handbook of Soccer, Pelé - My Life and the Beautiful Game, on album covers Joni Mitchell's iconic Blue, and on billboards and posters. They were also used to illustrate his first book, The Photographic Dictionary of Soccer, Warner Books. In 1978 he took one of the first western documentary crews to film in China and in 1982, finished his second book, The Language of Sport, published in the U.S. by Facts On File in hardback and World Almanac in paperback. In 1986 the book was also published in England and Australia by Angus & Robertson and in Japan by Yushodo Press Ltd. Mr. Considine also filled in for William Safire on several occasions for his On Language column in The New York Times Magazine and the International Herald Tribune. But it is automobiles and in particular motor racing that has always captured Mr. Considine's heart. At the age of sixteen, while still acting in Walt Disney films, he acquired his first racecar - and became the youngest car owner in America's professional motor racing sanctioning body, the United States Auto Club. Mr. Considine continued as a racing enthusiast and participant and in the 1980s began a new career as an automotive writer, contributing feature stories to various weekly and monthly publications, among them the Indianapolis Star, AutoWeek, Car and Driver, Velocity, Vintage Motorsport, Sports Car International, Sport Compact Car, The Robb Report, Vintage Racecar Journal, Corvette Quarterly, Jaguar World Monthly and Jaguar Owner. He was a 12-year board member and served two terms as President of the Motor Press Guild (MPG), the world's largest automotive press association. In 1996, Mr. Considine anchored the first live worldwide cybercast of the Indianapolis 500 on The Auto Channel website, also pioneering the use of streaming audio internet reports from the 24-Hour Le Mans race in France a few weeks later. 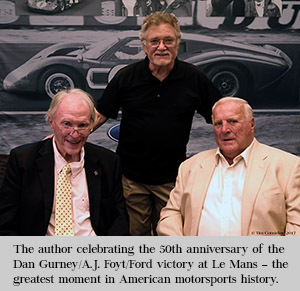 His highly-acclaimed third book, American Grand Prix Racing; A Century of Drivers & Cars, a history of American drivers and cars that have taken part in international Grands Prix, was published by Motorbooks International. In September of 1997, it received the coveted Dean Batchelor Award, MPG's highest accolade. Mr. Considine began researching and doing interviews for his Le Mans opus in the 1980s and has traveled there on multiple occasions as Contributing Editor for Road & Track magazine. Through his company, Considine Productions, he designed the content plan, hired writers and photographers, and assigned and edited over 200 stories for General Motors' website for the 24 Hours of Le Mans. He also has edited the English language pages of the Le Mans sanctioning body, the Automobile Club of the West (ACO). It is Mr. Considine's depth of experience in motor racing, in which he’s been involved since the 1950s, the many friendships within the racing community made along the way - witness the American icon who has done the Foreword - and in particular, his undying enthusiasm for the history of the 24 Hours of Le Mans that has engendered such extraordinary cooperation from so many participants for what he always says is, after all, their book. That unprecedented level of involvement by the American players - and their candor - is precisely what makes Twice Around the Clock - The Yanks at Le Mans a unique historical document that will make it desirable now and in the future. "We had a lot to learn – a lesson that the foremost European manufacturers have learned since, i.e. that to be successful at Le Mans it takes several years of competition to develop a car that will respond satisfactorily to the demands of the circuit for 24 hours of continuous high-speed driving." "I was sorry when I lost the car, but later, after I had come into the pits, my co-driver Freddy Wacker said, ‘Boy, am I glad I didn’t have to get in that car again!'." "We were faster than anybody. If we’d had a spoiler on the back end it would probably have made a difference, but no one had thought of that sort of thing yet. We thought it was a pretty clean body and it was – it was too clean." "I overcooked it at the end of the Mulsanne... I was trying to follow Briggs Cunningham in the rain around that tricky, nasty 120-degree turn and ended up in the sandbank. It took me about 45 minutes to dig myself out." "Yeah, we had first nailed until, oh, sometime Sunday morning. I came flying down toward Indianapolis, hit the binders – I ain’t got none! I write my name about three times in each direction (doing tank-slappers) and didn’t hit anything."